It's that time again. Capcom Japan has opened up a new poll for fans to vote on who they want to see made into Bandai's next D-Arts. There are 24 total characters ranging from various series. You can only select up to three choices. Further, Capcom has provided a field for you to suggest any other character not listed. You must provide your age and your favorite series (Mega Man, X, Legends, Battle Network, Zero, ZX, Star Force). Survey ends on May 16th. Although this poll is intended for Japanese audiences, there's no telling if Bluefin Tamashii Nations will follow through with their own. I'll keep you posted. Vile's ride armour or whatever it's called is there. Voted for it, Volnutt, and EXE. Vote goes to Iris, not thinking twice about it. Why? Because the other Megamen get a free pass just for being who they are. voted Ariga-style Megaman, Volnutt, and Iris. Ack, I just don't know whether to vote Black Zero or Iris. I mean, Iris would be completely deserved and awesome, but I personally wouldn't buy it. Now I would need a Black Zero to complement my Ultimate Armor X. Threw down my three votes. Here's hoping. Second armor, Model X, Copy X.
Yea, I'm a sucker for X. Would've tossed a vote for Ariga ver., then Volnutt if I had more votes. Yea, I know X already has a ton of variants (original, metallic, comic, First Armor, Ultimate Armor). But X2 is my favorite! 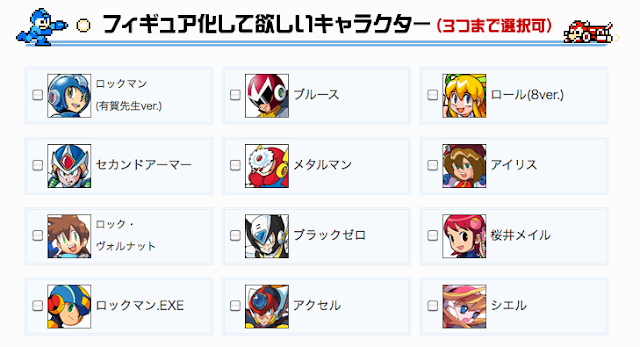 Feel like I shoulda voted for Model X and ProtoMan too, but I think ProtoMan is a given and Mode X is a long shot. you can buy black Zero repaints on online auctions. It's not a stable market, but it's there. I voted for Iris, Ciel, and Roll. The girls deserve a chance. Hahaha, its funny as hell how this is the only fansite still pretending to care about Iris. Anyway MMEXE and Z-Zero should take this. F Legends garbage, I hope the others cast a shadow over that piece of garbage. My votes goes for Ciel, Iris and Roll. Because my D-Arts figures are starting to smell like testosterone. Come on guys, show more love for the gurls! I honestly can't see myself paying anything near $50 for the others... maybe X2 Armor and Roll. You know what I'll vote for the underdog Over-1. I have rockman Xover on my phone. It's not as bad as some people think. If I had more votes I would probably vote for these: Model X (hope it comes with an Aile face and a Vent face, what? A man can dream. ), Black Zero (to go with Ultimate armor X), Ciel, MZ-styled Zero, and Axl. Iris would be nice too. OVER-1, because he has a cool design and just to piss people off. Metal Man, because why the hell is metal man on there. Is the paint job smooth, as good as Bandai's? Voted for Ciel, Model X and put "Misora Hibiki / Harp Note" into "Other". Not that I realistically hope for that. Man, the translations that Google Translate spits out at times. Bruce, Locknut Volcan, Ancient Writing, & Light heat Doo, I'd be really annoyed if it wasn't so amusing. Also, why are Eddie & Beat listed as choices for figures? They could easily just be accessories that come with a Proto Man or Roll figure. Either way, I cast my votes. Gone for Proto Man, Roll & suggested Dr Wily because... well we've got Sigma so why not, iirc there's only ever been one figure of Dr Wily over the years that came with a lab boxset i think but it'd be great to see a proper D-Arts version of him! judge for yourself, and you CAN buy from this, there's a service for it. Protoman, Volnutt and EXE. Because Iris was only in two games and she was annoying at best. Axl: my all-time favorite video game character EVER. Period. Copy X: His design is sick and I'd love to see it as a figure. Over-1. I like his design, and I think he'd look cool as a figure also. It's a real shame he's in such a crappy game. He could use some love. Also, I giggled at Google Translator's attempt to "translate" the page. Apparently, Servbot="Ancient Writing." Voted for Treble Boost Forte, Roll and Arigas megaman. Voted Rockman EXE, Shooting Star Rockman, and OVER-1. Volnutt, Iris, and Model X. ...really wishing Vent and Aile weren't such androgynous carbon-copies of each other when they suit up. The next best thing would be to write-in Aile. And for all that, I'd just write in Princess Pride. But that's IMO. Hmmm, I dunno, looked kinda rough on the backside. And those sabers are awfully dark. Anyway, I'm still going to wait on this poll considering that they've shown us Fake Zero before. My votes went to Axl, because I feel a set of the "trinity" would be worth having, and because Axl needs some love as of late. My vote also went to EXE and Volnutt. Why? Because I feel we already have an X and a Rock, so why not start getting more D-Arts of the other Mega Men? In my mind, close contenders were an Ariga Mega Man, to compliment the manga version of X (and because the design is great), Proto Man, but only if he came with Beat and Eddie, and Giga Armor X, because it would also be neat to start a set of all the armors. Iris = EMO garbage. The character appeared in one title and is dead; it would be a waste of space and plastic molding. Mega Man Volnutt, .EXE and Roll (8ver.) for the win. You have clearly not played Xtreme 2. Actually, I have. Several times. That's how forgettable her character is. Voted for Volnutt, Ariga Rockman and EXE. I don't really care much for Iris either, not really one of my favorites, but I also wouldn't mind it if she was turned into a figure. Anyway, I can't really figure out the rest of the poll options myself, so unfortunately can't place any votes. I would have voted for EXE and Axl though, since I feel that they could use the most attention. I voted for Metal Man and Axl. I want to see some good Robot Master figures. PROTOMAN AND AXL to comple the classic trio and x era trio!